Below are links to the current CCI brochures. 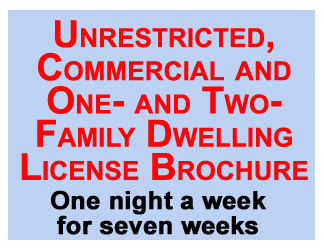 Click on the left block to view, download and/or print the Unrestricted Construction Supervisor License Course brochure. Click on the right block to view, download and/or print the Restricted, One- and Two- Family Construction Supervisor License Course brochure. Use your browser's back arrow to return to this page and website. Copyright © 1995 - 2019 Construction Certification Institute Inc.